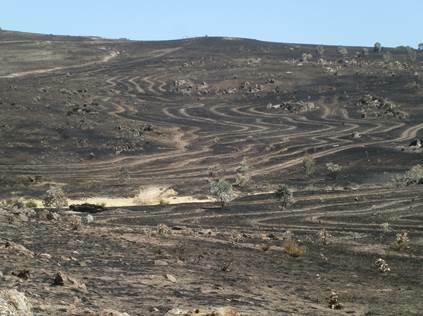 Fire risk is often a concern that is raised by our donors. It is a potential risk which we are insured against, however in our 17 year planting history we have only incurred one major fire on our sites and the results where surprising. The 2017 monitoring reports show that the sites are once again thriving. Our 2010 planting projects in South Australia’s Eden Valley (North East of Springton) revegetated two adjoining sites covering a combined area of 22 hectares, which were previously used for grazing. The sites are situated in a moderate rainfall area which is used as a watershed catchment area. The initial planting took place in 2010, in collaboration with Trees for Life – South Australia. This site was predominately direct seeded, focussing on linking the remaining strands of vegetation, and buffering the existing dominant vegetation of Blue Gum (Eucalyptus leucoxylon) and Peppermint Box (Eucalyptus odorata) grassy woodland with River Red Gum (Eucalyptus camaldulensis) lowland. On Friday January 17th 2014 a bushfire swept through Eden Valley engulfing 85% of the property – with the exception of the home and sheds. The fire’s ferocity left most of the seedlings just blackened sticks, and given the plants’ young age there was concern over recovery being possible. The initial assessment confirmed all plants were burnt with no green leaves remaining. Some plants retained their dry leaves (85%) whilst others (15%) were rendered to blackened sticks. There was great concern that many of the establishing plants (around 3 years old) would not recover. Revisiting the site 3 years on, the recovery rate was exceptional! Plants were growing new foliage, and there was evidence of new germination of seeds in the soil. Photo point monitoring was used to visually map the changing landscape over long periods of time. It captures seasonal changes, weed growth and changes in weed composition, and importantly the growth of revegetation and structural changes among the various species in any given species association that is being established. Whilst changes in the short term can be subtle and relatively slow it is important to continue monitoring to capture these events over the establishment phase in revegetation projects where outcomes such as carbon absorption are an imperative. The overall outcome is excellent.